The Striker has 3 identical points. Guitar picks can turn in your hand while strumming. With the Striker there is no need to panic because it will simply turn to the one of the other 2 identical points. 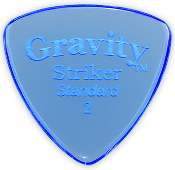 The rounded tips make the Striker a fast pick that’s great for all types of playing styles — from strumming to alternate picking. 3 picks in one.